Honokāne Nui Valley lies east of the more popular Pololū Valley along the beautiful sea cliffs and deep valleys of the northern Kohala coast. It was once possible to hike a considerable distance along this coastline until 2006 when an earthquake caused landslides into Honokāne Nui that destroyed the trail. Now, the trail ends at a picturesque overlook of the valley. 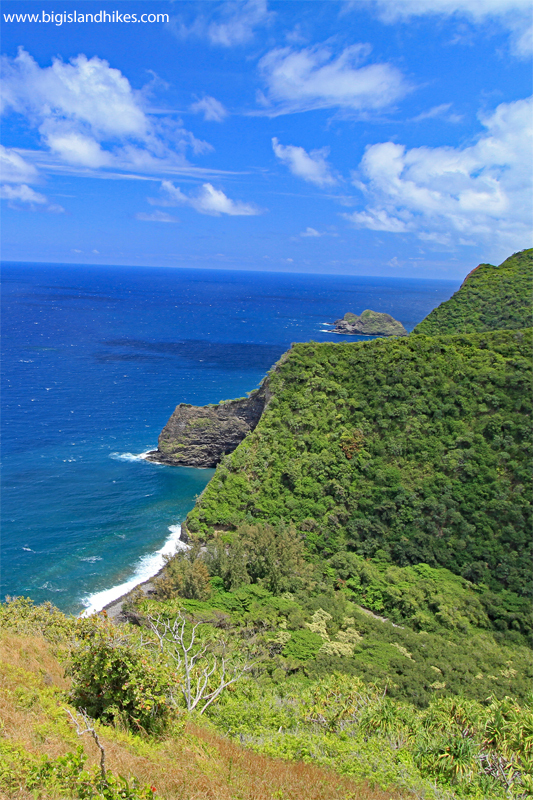 This moderate hike has considerable vertical gain and begins by passing Pololū Valley beach. Trailhead: Take Hwy. 270 to the northern Kohala Coast, past the towns of Hawi and Kapa’au. Park at the end of the highway at the Pololū Valley overlook. There is room for about 10 cars at the end of the road in a parking area that fills up quickly, especially on weekends. If you must park along the road, ensure that you respect the private homes and heed "No Parking" signs. Gear: Standard hiking gear, Bring plenty of water and sun protection, and don’t forget the mosquito repellent. The trail is rough and rocky, so boots are appropriate. Hike: Start at the Pololū Valley overlook and find the trailhead for the Awini Trail marked by an extensive array of “danger” signs. Hike down the wide trail and stop at each switchback in the trail to take in the awesome views of the northern Kohala coast. One switchback is a particularly good spot for a photo (you’ll know). The valley floor is 1/4 mile from the trailhead. Once on the valley floor, the flora changes abruptly into large ironwood trees just behind the beach. Quickly cross the Pololū River where it meets the sea (may be dry). This river is fed by agricultural runoff, so carefully consider how you treat this water before drinking. The Pololū Valley beach is mostly made up of moderately-sized polished lava rocks. The water here is notoriously dangerous and should only be attempted by very experienced swimmers and surfers. There is no lifeguard. The mounds of sand behind the beach are a fun place to spend some time. Look for the rope swings that are usually present. You’ll probably also notice some nice campsites, but camping here is illegal. Hike to the eastern side of Pololū Valley beach and find a faint trail in low ferns about one hundred feet behind the shoreline. This trail climbs for 1 mile and 750 vertical feet to the overlook for the Honokāne Nui Valley. The beginning of this trail is in a stagnant, buggy rainforest until you begin to crest the top of the next valley. Ensure that you stop whenever you have a vantage in the rainforest for views both inland and along the coast. The trail ends at a wooden bench that overlooks the Honokāne Nui Valley. Enjoy the view and return the way you came.